I was woken up today at around 6am in the morning by calls from two editors at Agence France Presse and the Associated Presse. A moment later, I noticed that I received two text messages very early this morning from two of my former classmates, Sorthy and Ritthy who ended their messages in the same way “True?”. “What’s true?” I wondered. Then, I reread the messages. I don’t know how to put into words, but all my senses were awake as soon as I reread. King Father passed away at the age of 89 at a hospital in Beijing early this morning. Just another 16 days would be his 90th birthday. Whereas, Facebook and Twitter in Cambodia have been loaded with many messages and old and young pictures of him. Cambodian Facebookers expressed condolences and grief over his passing away. Words ranging from “Cambodia’s hero, patriot, influential figure, most revered king, beloved king” were seen from one message to another. However, some have mixed or ambivalent views and feelings over the news shown in their FB status updates, but what I can certainly find in common among all those messages is that they all love the late king who had lived in and experienced the turbulent history of Cambodia. Born on Oct 31, 1922, the king had lived through the rule of the French, the Sangkum Reastre Niyum regime, Lon Nol regime (when he was ousted), Khmer Rouge regime (when he worked along a bit with them at the beginning but was later put under house arrest), and the post-Khmer Rouge periods including the Vietnamese-installed regime, the UNTAC-assisted regime, another political standoff resolved by having “two prime ministers” and later a one-premier country. My view about him is, he was a flawed man and a very selfish man at time, but for all he had done, in his mind, he thought he was helping his country, I believe he was a true patriot who has to face the challenge of overcoming the cold war between world powers and overcoming the resentment of the Western power after being ruled by one for 90 years. I have ambivalent feelings for him generally, but on this occasion, may His Majesty Former King Norodom Sihanouk – supposedly the last of the reigning Angkorean God-Kings, rest in peace. My condolences to the Khmer Royal Family and the Khmer nation. It is with tears and deep sorrow that I mourn for Our King Father HIS Royal Highness NORODOM SIHANOUK. I am deeply affected by the loss and sad for not being in Cambodia to be closer to The King who has written Cambodia’s history, but also the music I have sung throughout all my childhood. HE was Our Grandfather, a role model and a leader, loving and caring for his subjects. I will be mourning in HIS loving memory. There are also very few of those who called themselves “very lucky” to have touched and shaken hands with late King Father in the past. Pictures of themselves taken with late King Father were also released on their Facebook pages, too. The most constant name in politics in Southeast Asia for more than half a century has been King Norodom Sihanouk of Cambodia. He has played the roles of divine king, politician, communist front man and constitutional monarch. No other figure has matched him in longevity, popularity, political acumen on the international stage, and sheer ability to play the dirty game of politics and survive. Throughout his life he has survived numerous wars, he has been overthrown, he has been sentenced to death, he has been a nominal guerilla, Prince, King, dictator, a prisoner in his own country and has symbolized an ancient, traditional, Cambodia, a bloody communist slave state, monarchy, and democracy. He holds the world record for politicians with the most numerous positions in government and father figure to the only southeast Asian monarchy to have been restored after falling in the communist takeover after World War II and deposed again by his erstwhile allies, Pol Pot’s Khmer Rouge. The life story of Norodom Sihanouk is one of being admired, condemned, unique and always controversial. It is arguable that Cambodia would not exist as a nation without his contribution. It was announced that Prime Minister Hun Sen and current King Norodom Sihamouni are travelling to Biejing today to bring back the body of late King Father to Cambodia. Besides all the condolence messages, Cambodian Facebookers complained that the Cambodian government reacted slowly to the shocking news, and that the people of Cambodia have the rights to know how the royal funeral will be hosted or organized. The slow reaction, I guess, has caused Cambodians to take to the Internet especially Facebook to express their mourning for King Norodom Sihanouk. The reaction might be very slow because perhaps it is very unexpected. Also, today is the festival of the dead “Pchum Ben” when the ghosts of the ancestors walk the earth and wait for offerings from their children and grandchildren, so many people including some government officials have to return to their hometown. 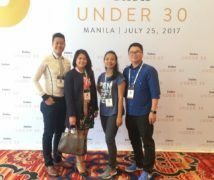 A few local television stations like TVK started to broadcast some video footage of the previous times and asked TV hosts and hostesses to adorn themselves with white shirts and shawls, and if male, a black suit over the white shirt. The president of TVK wrote on Facebook that the body of late King Father sent from Beijing will be accompanied and broadcast by journalists from many big countries. A Facebooker also mentioned that it might be very difficult for the Ministry of Cults and Religion to prepare for something very unexpected and high profile like the royal passing away of one of the most influential figures. Towards this evening, all the entertainment outlets, concerts, or performance will be banned from TV and in public or private places. You can read stories (links) written by big media companies like BBC News, AFP, AP, New York Times, CNN, Sydney Morning Herald expected to go frenzy covering the story within the next few weeks or so. My personal note about late King Father is that he was a very influential but also extremely controversial figure and leader Cambodians have ever had of all times. There are so many stories to be discovered and many learned about him. What made him decide to do what he had done? Called “political chameleon”with a long life and twisting role in Cambodian politics for years in an article by the Sydney Morning Herald, he sometimes admitted during interviews with journalists that human beings make mistakes, and so did he. Will the passing away of King Sihanouk impact the politics in Cambodia? What would Cambodia be like after his presence was gone? 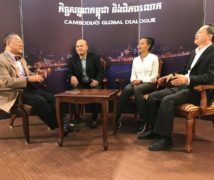 When he was still in the country, he opened doors to all political members, either from the ruling party or any opposition party to come and discuss Cambodian politics with him. He also helped free some political dissidents, but on another note, he also imprisoned and even executed some opponents when he ruled Cambodia before the Khmer Rouge regime. I am feeling strangely sad after I’ve watched this video “Goodbye Cambodia” (posted below) sung by late King Father, especially thinking of how my grandparents whom I believed were stauch believers of King Sihanouk, would react if they had heard of this. He had written pretty much of the modern history of Cambodia, and as a Cambodian, I hope to see it end with clarity with all due respect. Goodbye Cambodia. I’d like to bid Goodbye to you with sadness. Every day, my “heart” longs to be connected with you. In the past, we have lived together, and shared good and bad times together. Now, whatever will happen, I promise that I’ll always be with and loyal to you. Though far from you, I’m never tired of you. I have undying love for you because you are my motherland/homeland. I want to serve and defend you till I die, and serve you with all my heart, and live with you till death. Oh Cambodia. I’d like to say Goodbye to you. I saw this video this morning, but I don’t know enough Khmer to understand all the words. Can you post a translation? or just the main idea of the song? Honestly, some words weren’t clear to me, so I’m writing what I can undertand here. Its been sad time for Cambodia and the Khmer people who have lost the father King! But he left now and be in heaven it would be nice to think that he rested and finally his struggle to save the nation have been ended. He will always be remembered by each people in Cambodia and his legacy to the nation. He will always remain as Father King of Cambodia. GOD save the young King ! Thanks Kounila to your very nice blog its well said. My deepest condolence to the Royal family and all the Khmer people. R.I.P King Norodom Sihanouk…, The people in Cambodia love you. We love our king they say and We are mourning for our King. May God bless you. thank you sister. i really love this post so much. you really brought out the complex and differing opinions about the King. and btw, i think your writing is getting better and better with every new post. congratulations and i look forward to reading more. Thank you sister for this post. I can’t stand crying when listening to this song. It seems like his saying goodbye to us.. miss him very much. 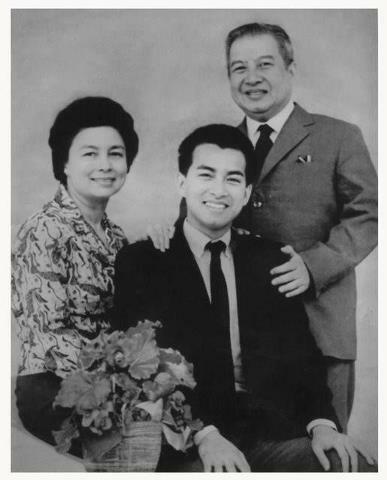 Great blog about the late King Father, Norodom Sihanouk. He will always be the greatest king of Cambodia, and a true Khmer patriot. May he rests in peace. Well, from my perspective, he was a good man to many Khmer people, and bad to some. I personally have nothing against our king. I used to go to the airport in Minnesota to welcome our king when he came to visit Khmer people who live in the state of Minnesota. I was in high school at the time. We carried a big sign, says, “Vietnam must get out of Cambodia”. The king was a negotiator at the time to get Vietnam out of Cambodia at that time. No matter what a person trying to do, not all people will love and respect you. There always some people who will hate you and want to hurt or destroy you. Especially, being a politician. I believe he did a lot for the people of Cambodia. His memory will live in our hearts forever. RIP the King Father.